Preheat oven to 350° F. Line 2 half-sheet pans with parchment paper. Pour 1 cake mix into a medium bowl. Mix in 1 1/4 cups water, 1/3 cup oil, and 3 egg whites. Beat by hand for 2 minutes or until well mixed. Stir in 50 drops of red food coloring. Spread red cake batter onto prepared baking sheet and set aside. In a second mixing bowl, combine the second cake mix, remaining 1 1/4 cups water, 1/3 cup oil, and 3 egg whites. Beat by hand for 2 minutes or until well mixed. Stir in 50 drops of green food coloring. 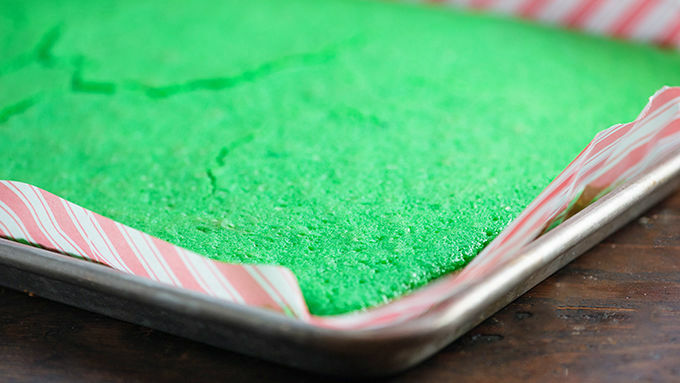 Spread green cake batter onto prepared baking sheet. Bake both cakes for 17 minutes or until a toothpick inserted in the center comes out clean. Let cool completely. Cut each cake into 30 equal-sized pieces. Add the frosting and marshmallow creme to a mixing bowl and stir to combine. Spread the frosting mixture over each piece of cake and top with a second piece of cake. Add sprinkles as desired. You can stack in twos or fours, but the stacks of four are more likely to topple over and will reduce your serving count to 15. I’m sorry, but no. I cannot eat this cake. I cannot look at this cake. I cannot even think about this cake. Want to know why? Because I immediately start singing Christmas songs. It’s ridiculous. And nobody wants to hear me sing Christmas songs. Trust me on that. There’s just something about these festive little treats that puts me in the Christmas spirit! I bet they’ll do the same for you. I love how simple this is to make. 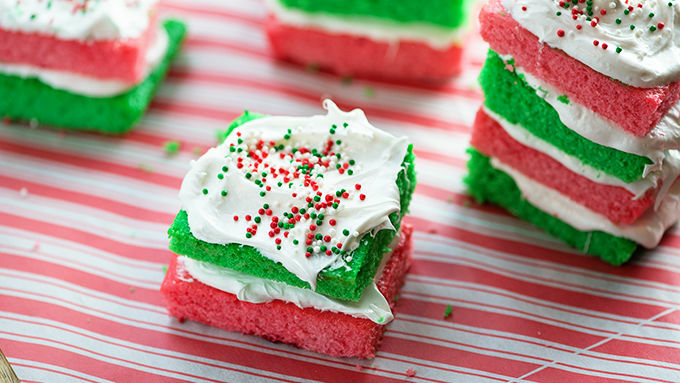 They’re one of those desserts that look like you put a lots of time and effort in—when really you just threw some food coloring at a cake mix! 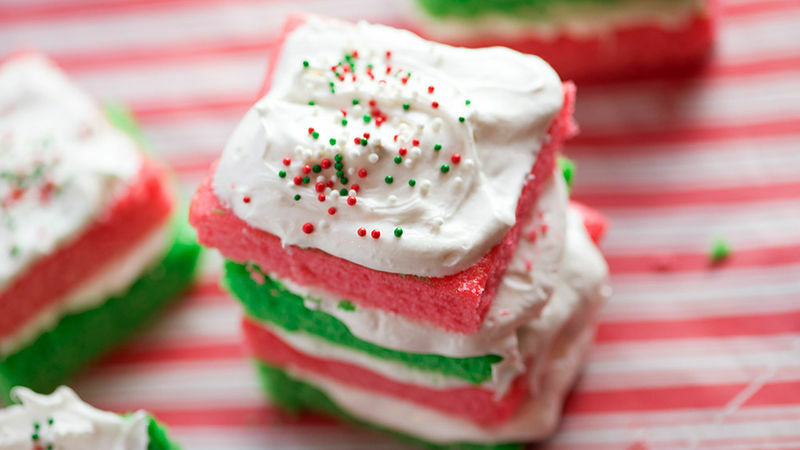 Spread them with frosting, stack them up and top with sprinkles.